Cooking For One: Deeeeeeeeamn Boyeeeeee! OK...for a long time now (years maybe? 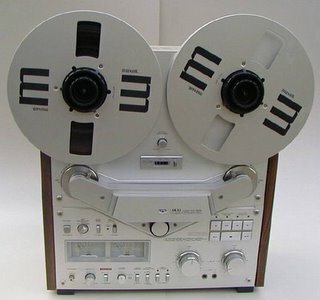 ), I have wanted a reel to reel 4 track recorder. It just seemed so old school. So....right, ya know? And thanks to Bob's moving into a new house, I have one. It's the Akai GX-636DB, circa the 80's. From what Bob tells me, it's practically flawless. He even threw in some reels to go along with it (classic rock-it's like he knows me!!). I also have the reels from when Radio Shack was getting rid of all of their stock. I'm pretty jazzed for this, for primarily one reason. My dad has reels from his deck when i was a kid. I'd like to transfer these over to CD before they're gone for good (or get too brittle to play anymore). Plus, I'd like to just have at it with a 4 track, reel to reel style (even though my cassette 4 track isn't getting a whole lot of work right now)...but it's just the principle of saying "I can do it, bishes." so, yeah. That's my other woody of the day.